Outside of the quarterbacks, I don’t know if there is a more polarizing player in the 2017 NFL Draft than Cam Robinson. Some believe Robinson is clearly the best tackle in this draft class, and could potentially be a top 15 pick this April. Others have Robinson graded in third round, or even worse. Being a self-proclaimed offensive line-guru, I just had to get my thoughts on Cam Robinson out in the open. At 6’6″ 322 pounds and with 35.5″ arms, Cam Robinson is the prototypical left tackle. He has an outstanding frame, a well-proportioned body, and thickness in his lower-half. With this thickness comes extraordinary strength from Robinson, and the ability to absolutely maul defenders in run blocking. When asked to drive or down block, Cam Robinson is at his best. He is powerful enough in his lower body to drive his hips through contact, accelerate his feet, and move defenders out of the hole. Robinson fires off the ball with authority, and has a strong punch to jar defensive ends back right from the jump. Working well with guards when double teaming, Robinson also has the athleticism to get to the second level and cut off linebackers. Robinson looks controlled and athletic when getting to that next level. Once he gets his hands inside of you, it’s all over, especially if you don’t have some weight in your pockets. In pass protection, Robinson flashes the ability to be a top-tier tackle at times. With his length and strength, Robinson is able to create extension and slow down rushers with his rush. With good, smooth feet Robinson can get vertical quickly to cut off edge rushers and steer them around the quarterback. If you’re edge rusher doesn’t have top-level bend, he is going to have a hard time getting around Robinson on pass plays. Robinson’s athleticism flashes on film, with a good kick-set and the ability to power down seamlessly. 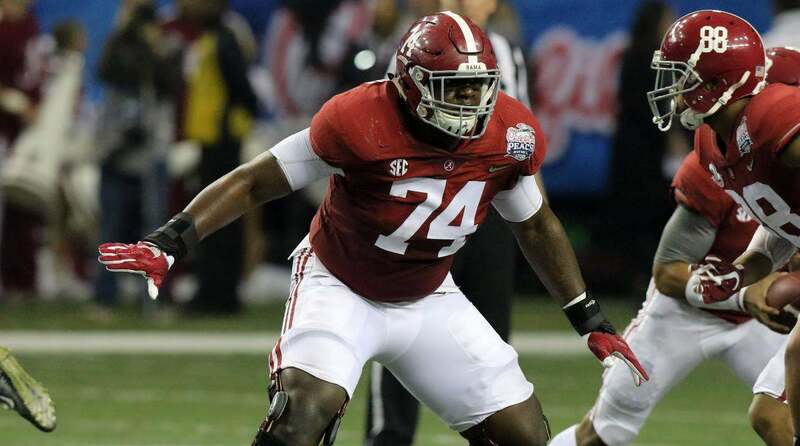 When he’s good, Cam Robinson is clearly the best offensive tackle in this year’s NFL Draft. The problem, of course, is that he’s not always good. The biggest concern I have with Cam Robinson are his balance issues. Too often he loses his balance, ducks his head, and lunges at defenders. With his length and powerful punch, Robinson should never have to overcompensate against defenders, or stop trusting his technique. Robinson must keep his feet active through contact at the next level, and cannot bend at the waist as he does here. For as athletic as he is, Robinson allows himself to look silly at times due to his leaning. And believe me, it is almost always by his own doing. Rarely did I see Robinson get cleanly beat by defensive linemen when he displayed his best technique. When Robinson stays patient in his kick-set, keeps his feet active, and trusts his punch/technique, there are only a few defensive ends who can still beat him. Though he sometimes looks like the New York Giants’ Ereck Flowers, I still believe that Cam Robinson deserves to be taken in the first two rounds of the 2017 NFL Draft. Considering his youth, athleticism, power, and overall upside, I think Cam Robinson is the top offensive tackle in this draft class. He will need to be coached up in his pass protection to fix his balance issues and to keep his feet/hands active through contact. But once he gets these problems shored up, Robinson can be a very good left tackle at the next level. If I’m picking in the first round and need a left tackle, I am looking to Cam Robinson before any one else in this class.